Children in the US are getting more ear infections now then ever. 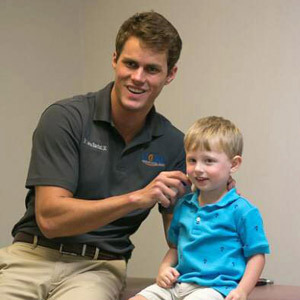 In the US, there are over 10 million new cases of ear infections (otitis media) diagnosed each year, accounting for 35% of all pediatrician visits, or 25 million office visits per year. This cost for treatment is around 3 billion dollars a year. It is estimated that 62% of American children will have an ear infection before the age of one, and 80% will be diagnosed by age three. Studies show that the earlier the first infection, the likelihood for repeat infections increases. Ear infections are the most common reason for antibiotics in children, although the majority of infections are caused by viral infections, not bacterial. Inserting tubes into the ears is the second most common reason for surgery in children under the age of two. The surgery must be repeated in 20-30% of cases. One cause is mechanical obstruction. This happens when there is a blockage due to misalignments of structures around the ear and ET, such as the bones of the jaw, skull and cervical spine. When small bones in the skull and neck area can’t move properly, fluid may not be able to drain properly and can get built up in and around the eardrum and ET, giving microbes a place to grow and cause problems. Chiropractic adjustments can realign the misaligned bones that may be causing the draining blockage. By allowing the fluid to drain again, this allows the body to “defeat” the ear infection on its own. Not only helping “defeat” your child’s current ear infection, but chiropractic may also help prevent other ear infections in the future by correcting the cause of the ear infections, the misaligned bones. A research study revealed, 80% of children were ear infection free for a six-month period after their chiropractic adjustments. Want more information on chiropractic and ear infections? Please visit the International Chiropractic Pediatric Association website, which has 25 research articles on this very subject. Then, give us a call to find out ow we can help!